8 minute walk from Edinburgh Waverley train station. 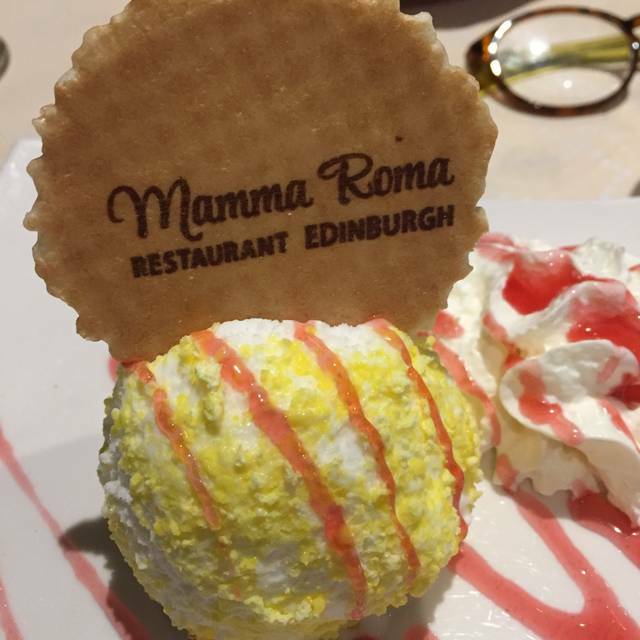 Mamma Roma is an authentic Italian restaurant located at 4/7 Antigua Street Edinburgh. Situated very close to the Edinburgh Playhouse, this restaurant is not only great for Pre-Theatre diners but also has a delicious and extensive choice of menus to satisfy all customers. The restaurant can also be found within a 10 minute walk of Princes Street Gardens and a convenient 5 minute walk from Edinburgh Waverley train station. Mamma Roma’s restaurant is spread over multiple floors. The main dining area is decorated in Tuscan farmhouse style with paintings and medallions embellishing the walls. Special attention is given to the elaborate list of pasta and pizza delicacies and a bowl of gelato or a plate of tiramisu helps to round off a meal on a savory note. Toasted bread with mozzarella cheese and garlic butter. Toasted bread with roasted peppers and goats cheese. Toasted bread with fresh tomatoes, garlic, olive oil and basil. 2 slices of garlic bread, 2 of bruschetta, 2 of crostino with goat cheese and peppers, 2 of garlic bread with cheese and a small bowl of mixed olives. Artichokes, aubergines, olives, sun dried tomatoes, all preserved in olive oil. Served with home made bread. A selection of Italian cured meat, mozzarella, olives, artichokes, sun dried tomatoes, giardiniera and Parmesan shavings, served with home made bread. 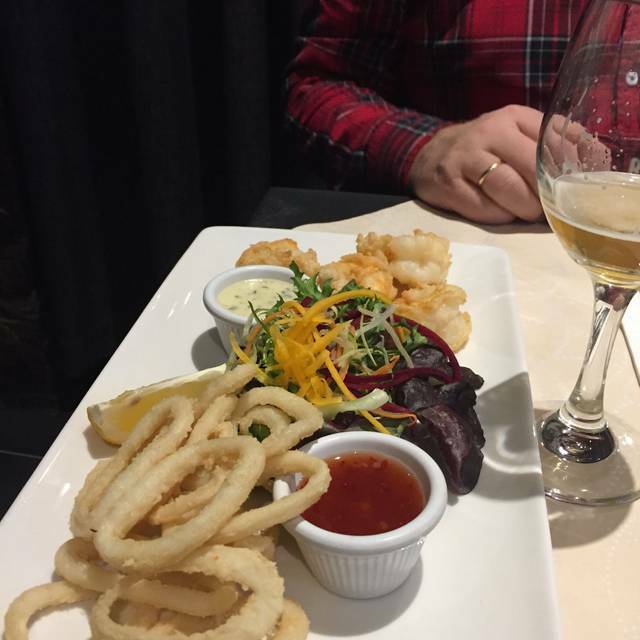 Deep fried squid and king prawns, served with salad garnish, sweet chilli sauce and tartare sauce. Pizza bread with rosemary, garlic and olive oil. Pizza bread, tomato sauce, chilli, garlic and rosemary. Pizza bread with garlic and mozzarella cheese. Pizza bread with rocket salad, balsamic glaze, olive oil, freshly chopped tomatoes and parmigiano shavings. Mixed lettuce, radicchio, rocket, iceberg, tomatoes, cucumber, red onions, peppers and olives. Tomatoes, red onions, oregano, basil, olive oil and olives. Rocket salad, parmigiano shavings, olive oil and balsamic. Avocado, prawns with maria rose sauce, smoked salmon. Served with salad garnish. Smoked salmon with artichokes. Served with salad garnish. Prawns with maria rose sauce served on a bed of mixed lettuce. A variety of cured meats, olives, sun dried tomatoes and Parmesan shavings. Tomatoes, mozzarella, basil and olive oil. Served with salad garnish. Mozzarella cheese and Parma ham. Served with rocket salad garnish, tomato and cucumber. Home made with 100% steak mince meat balls. Oven baked with tomato sauce, mozzarella and parmigiano. Served with toasted bread. Oven baked aubergines with tomato sauce, parmigiano and mozzarella cheese. Mushrooms cooked with garlic, wine and butter. Asparagus wrapped with Parma ham, cooked with garlic, wine, cream and parmigiano. Served with toasted bread. Deep fried squid. Served with salad garnish and tartare sauce. King prawns cooked with garlic, chilli and a touch of tomato sauce, served with toasted bread. King prawns cooked with garlic, parsley, butter and white wine. Served on a bed of rocket salad with parmigiano shavings. Fresh mussels cooked with garlic, chilli and a touch of tomato sauce, served with toasted bread. Grilled aubergines, courgettes, peppers, carrots, potatoes, olive oil, garlic, herbs and parmigiano cheese. Served with salad garnish. Stuffed pasta with roasted peppers, goats cheese, cooked with tomato sauce and a touch of cream. Pasta stuffed with ricotta cheese, spinach, parmigiano and cooked with tomato sauce and mozzarella. Pasta stuffed with 100% steak mince, vegetables, nutmeg, wine, cooked with tomato sauce and mozzarella. Home made lasagna cooked with besciamella, 100% beef mince, nutmeg, cheese and mozzarella. Pasta stuffed spinach and ricotta cheese, cooked with tomato sauce, parmigiano cheese and a touch of cream. Grilled Sirloin (we recommend medium rare) which is then cut in to slices and placed on a bed of rocket salad with a few chopped tomatoes, parmisan shavings, olive oil and balsamic glaze. Wine, mustard, cream, green peppercorn and demi glace. Garlic, olives, capers, wine and tomato sauce. Onions, mushrooms, wine, cream, demi glace and mustard. Mushrooms, red wine and demi glace. Veal. Served with potatoes and vegetables. Veal cooked with peas, smoked bacon, onions, wine and cream. Veal cooked with Parma ham, wine and Parmesan cheese shavings. Veal cooked with sweet wine marsala, mushrooms and a touch of cream. Chicken. Served with potatoes and vegetables. Chicken breast cooked with onions, roast peppers, wild mixed mushrooms, a touch of chilli and cherry tomatoes. Chicken breast and asparagus wrapped with Parma ham, cooked with cream and cheese. Chicken breast topped with black pudding and cooked with sweet wine, and cream. Chicken breast topped with spinach and mozzarella, cooked with tomato sauce, a touch of nutmeg and cream. Grilled chicken breast served with salad and potatoes. Two skewers made with king prawns, monk fish and vegetables, served with mixed salad. The chef combines fresh fish and shellfish to create a simple yet luxurious grilled seafood dish, flavored with herbs and garlic. Served with grilled vegetables. Monk fish wrapped with Parma ham then cooked with garlic, cherry tomatoes, olive oil and white wine. Served on a bed of spinach. Two fillets of sea bass cooked with cherry tomatoes, garlic and wine. Served with grilled vegetables and potatoes. Paccheri are very large hollow tubes approximately an inch in diameter, a bit like giant maccheroni. 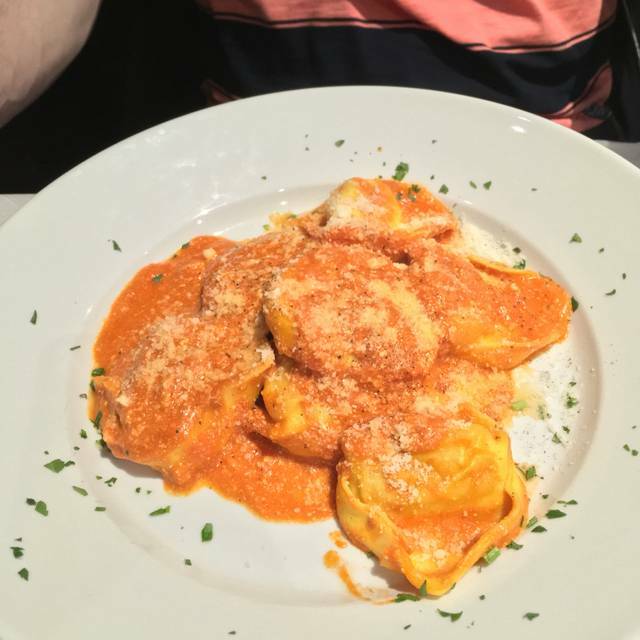 They originate from Naples and are an absolute classic of Neapolitan cuisine. Cooked with prawns, crevettes, artichokes, garlic and cherry tomatoes. Cooked with roast peppers, olives, chilli, cherry tomatoes and wild mushrooms. Cooked with peas, squid, cherry tomatoes, garlic and basil. Cooked with cherry tomatoes, basil and goats cheese. Stringolini is shaped by rolling a small piece of dough on a flat surface to form a short, round length of pasta with tapered ends, then twisting it to form the final shape. Stringolini cooked with roasted peppers, pesto, touch of cream and goat cheese. Stringolini pasta oven baked with tomato sauce, meat balls, parmigiano and tomato sauce. Stringolini pasta cooked with strips of veal, peas, onions, parmigiano, a touch of cream and tomato sauce. Pasta cooked with mushrooms, onions, chicken, tomato sauce, Parmesan cheese and a touch of cream. Pasta cooked with garlic, basil, chilli, oregano and cherry tomatoes. Pasta cooked with onions, diced pancetta (cured pork belly), chilli, tomato sauce and cheese. Pasta cooked with parmigiano, egg, cream and bacon. Pasta cooked with bolognese sauce made with 100% steak mince. Cooked with king prawns, monk fish, mussels, garlic, wine and cherry tomatoes. Linguine pasta cooked with garlic, chilli, olives, anchovies, capers and tomato sauce. Pasta cooked with gorgonzola cheese, mushrooms, onions, bacon, peas and cream. Pasta cooked with smoked salmon, mushrooms and cream. Pasta cooked with pesto alla genovese, cheese and a touch of cream. Rice cooked with mixed seafood, garlic, wine and tomato sauce. Rice cooked with mixed vegetables, parmigiano cheese and a touch of tomato sauce. 12/13". All pizzas are made with 100% Mozzarella cheese. (30 to 33cm), EXTRA TOPPING: VEGETABLES:£0.50 / MEAT: £2.00. 7" inch pizza of your choice with half potion of pasta of your choice. Mozzarella, tomato sauce, roasted peppers, olives, mushrooms and artichokes. Mozzarella, tomato sauce, roasted peppers, sun dried tomatoes, potatoes, red onions. Mozzarella, tomato sauce, blue cheese, parmigiano and goats cheese. Tomato, cheese, aubergines, parmigiano and basil. Tomato sauce, mozzarella, fresh tomatoes, anchovies, chilli, capers and olives. Tomato sauce, mozzarella, rocket salad, Parma ham and Parmesan shavings. Tomato, mozzarella and Parma ham. Tomato, cheese, mushrooms and chicken. Tomato, cheese, sweet corn and chicken. Tomato, cheese, spicy pepperoni sausages and spinach. Tomato, cheese, smoked salmon and prawns. Tomato, cheese, bacon, onions and chilli. Tomato, cheese, and spicy pepperoni sausages. Tomato, mozzarella, salame and mushrooms. Tomato, cheese and meat balls (cooked in a rich tomato sauce). Tomato, cheese, mortadella and olives. 20 to 30 mins to cook, Calzone is an Italian turnover made of pizza dough and stuffed with tomato, mozzarella, chicken, ham, mushrooms. The dough is then folded over, sealed along and slowly baked. 20 to 30 mins to cook, The same as above only cooked with mozzarella, tomato sauce, roasted peppers, sun dried tomatoes, artichokes and red onions. Loved the pasta and risotto dishes, but the pizza's were deep pan style for both adults and kids, and my husband found it very doughy and didn't enjoy it much. The kids pizza's were gigantic, barely any smaller than the adult pizza's, so they weren't able to finish them. We dined pre theatre menu, booking through open table we got an excellent window table. We have dined there previously at the same table. We enjoyed the food, the service and the way they looked after our 6 year old on her first theatre visit. I would recommend it to anyone. Really enjoyed the ambience and the food. On hand for the Playhouse Theatre and everything worked really well. A lovely restaurant. Very attentive staff. Food was good. My daughter loved her pizza and the Nutella cheesecake was yummy. Thoroughly recommended. Great service and amazing food. Good for families. Went there before going to the theatre. Staff friendly. The place was full but food still came quickly and in plenty time for the theatre. 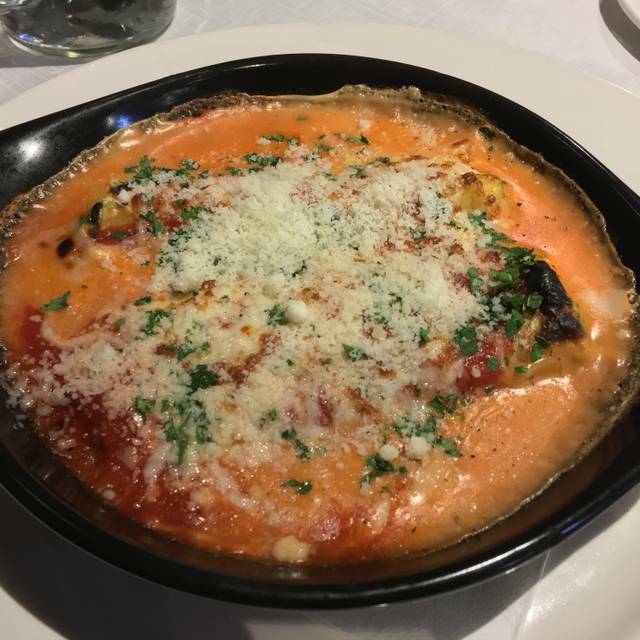 Always reliable for a great plate of Italian. Staff great, service good. The food was lovely we spent a lot of time here eating and drinking. The price was very reasonable. I will return when back in edinburgh. Carbonara was tasteless, lasagne was burnt on the bottom & cold in the middle, think it was pre-cooked & reheated, would not go back. Waiting staff very friendly, lovely to chat to. Restaurant has a welcoming atmosphere and large varied menu. Everything sounded delicious, and everything we ordered was. My pizza marinara was out of this world. Real seafood on top, and the taste was just like what you get on holiday abroad. It's hard to find such good pizza in the UK! Thank you, we will return. Thoroughly enjoyed our pasta dishes, couldn’t fault it. The pre theatre menu is the best value for money. The choice was not extensive but there’s something to suit all tastes. Service was quick and waiters very attentive. Good food with friendly service at very reasonable price, what more do you need ? it was nice to go into an Italian Ristorante that actually speaks and play Italian music and, Maria who looked after us was very nice and we chatted about what part of Italy her family was from the service was very good as the food would I recommend here a definitely a yes. Staff were very welcoming and attentive. We had pre theatre menu which was great food and great value. Incredible service, food and atmosphere! I can’t recommend visiting this restaurant enough! I shall definitely be going back! Excellent range of food. Very tasty meal and friendly, cheerful staff. Thoroughly recommend this restaurant. Easy and delicious. The staff are exceptionally friendly. Will return again and again. Amazing pizzas, in fact best ever calzone pizza. Really good atmosphere when we visited on a Saturday night. Really enjoyed my very first visit to Mamma Roma's, very quick service and the lovely young lady who served us our meal more than compensated for the rather sombre and unsmiling men who were serving (although they were very mannerly) they really need to follow the example of the beautiful smiling, warm and friendly young lady they work with. Would look forward to visiting again, next time I am in Edinburgh. This lovely restaurant was recommended by my parents who have gone there for pre theatre dinners. We were not disappointed. My husband was very impressed by his calzone and I would recommend the speciality pasta with prawns, courgettes, garlic and basil. My sons all enjoyed their pizzas which were as good as any you would get in Italy. The garlic bread was also very tasty. The service was excellent, we were very well attended to. Would definitely return. Was not really overly impressed. Was a bit annoyed when I was informed on arrival that they did not have my booking. I rec,d a reminder about my booking so how would they not have it. Was quite embarrassing in front of my friends. Very pricey for what it is especially considering none of the pasta is fresh. Très bon accueil, service agréable et de très bons produits bien cuisinés, je recommande ! A friend and I had a lovely meal here. It was very quiet though even at lunchtime. We were the only diners except towards the end of our lunch another party came in. So the ambience wasn’t as good as it could have been. However we had a three course lunch for £8.95 each! We had a lovely early evening dinner and will certainly be back. Having booked a table through opentable we turned up at the main restaurant and they did have our reservation but we were escorted downstairs with no explanation to what I would describe as an overflow room and after some consultation with other staff we were told we could sit at a nearby table which was set for three. The waiter then asked if there was only two of us and swiped the third setting away. By this time instead of a good feeling we felt like a nuisance who had just turned up off the street. I cannot fault the service or the meal but they need to learn how to deal with customers better as regards seating. The whole time we were there the door was continually opening and letting in the cold as other diners who came downstairs and were then ushered up and vice versa. I have eaten here twice before but was very disappointed as there was no welcome and we really were made to feel very uncomfortable. Very slow service. We had to wait too much between dishes. Beside everything was perfect. Waitstaff was very nice and attentive. The food was delicious. My parents went back again two days later! It was fine overall, nothing spectacular. Decent Italian food but nothing stood out as memorable or worthy of a return visit.